BodyTech is the in-house sports nutrition brand of Vitamin Shoppe, a well-known supplement chain with over 750 stores in the United States. 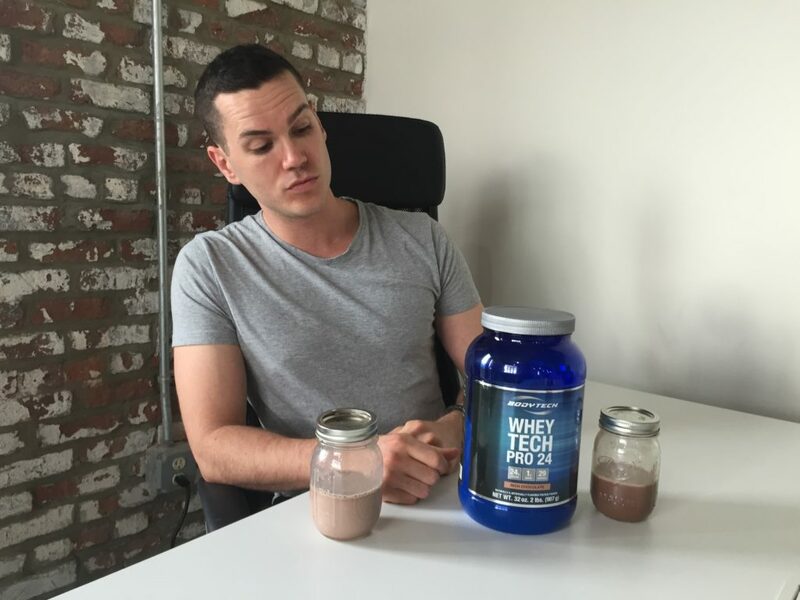 The line has a few different protein supplements that include a whey isolate and one that’s just called “Whey,” which is mostly whey concentrate and is a little lower in protein per serving. 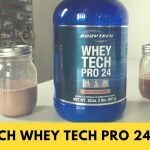 I decided to try out their middle of the line brand called Whey Tech Pro 24, a blend of whey isolate and concentrate that appears to be deliberately engineered to compete with the most popular protein powder on the market, Optimum Nutrition’s Gold Standard. The ingredients are almost the same, the macros are identical… what’s different? Shop BodyTech’s Whey Protein HERE. One serving provides 120 calories, 24 grams of protein, 3 grams of carbs (1 gram each of sugar and fiber), and 1 gram of fat (half a gram of saturated fat). That’s a pretty competitive macro split, and gram-for-gram it’s the same as popular competitors Optimum Nutrition, Cellucor Cor Performance, MusclePharm Combat Whey, Ghost, and My Protein’s The Whey. There’s not much to say about the micronutrients. It’s tiny bit high in cholesterol and sodium (12 and 8 percent of the RDI, respectively) and a little low in calcium (10 percent of the RDI) but there’s nothing really surprising. I picked up the Rich Chocolate flavor, and the first ingredient is a protein blend of whey isolate and concentrate. Isolate has more protein (and it’s more expensive) than the cheaper whey concentrate, so it’s always nice when isolate is the first ingredient. The next ingredient is cocoa, followed by natural and artificial flavors, soy lecithin (for mixability), salt, xanthan gum (a thickener and stabilizer), the artificial sweeteners acesulfame potassium and sucralose, the digestive enzymes lactase and Aminogen®, and lastly glutamine peptides. I haven’t seen a whey protein with glutamine peptides before. As is the case with whey peptides (a.k.a. hydrolyzed whey), glutamine peptides absorb a little faster than regular glutamine. Glutamine is already the most abundant amino acid in the body and there doesn’t appear to be any real reason to supplement with it, at least not as a muscle builder. The digestive enzymes are a nice touch, though; Aminogen appears to help the body absorb protein and minimize digestive issues like flatulence that are sometimes associated with a high-protein diet. Lactase, meanwhile, may reduce indigestion among folks with lactose sensitivities. 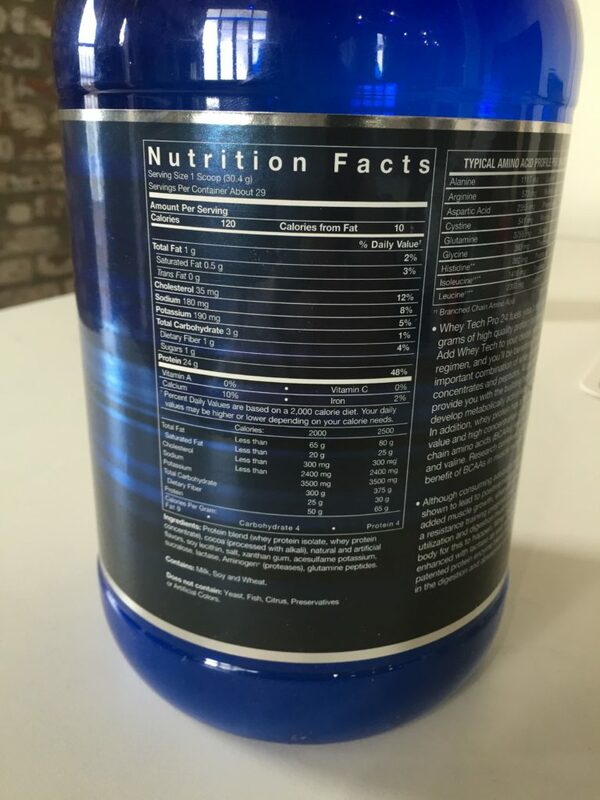 The ingredients list really is practically identical to Optimum Nutrition’s Gold Standard, the main difference is the glutamine, the fact that BodyTech has sucralose (which is a lot less controversial than acesulfame potassium), and the fact that Gold Standard also has some hydrolyzed whey in addition to whey isolate and whey concentrate. Honestly, BodyTech has made a really solid product. It’s got a great macro split and plenty of enzymes, the only ingredients people might take issue with are the artificial sweeteners and the soy lecithin, two things that a lot of health-conscious folk try to avoid. You can pick up a two-pound tub for $22 online, which provides 29 servings at 75.8 cents per serving. That winds up at 3.15 cents per gram of protein, though if you spring for a five-pound tub it’ll drop to 2.8 cents per gram of protein. That’s very, very cheap. It’s cheaper than GNC’s house brand and famously inexpensive brands like Muscletech, Musclepharm, and Optimum Nutrition. There are a few whey concentrates out there that are cheaper, like EAS, but BodyTech is the cheapest whey blend that I’d actually recommend. It mixes very well! The powder dissolved quickly and easily. It comes out a little frothy, but that never bothers me — it just makes me think of a milkshake. I was really surprised by how good this protein powder tasted. Normally a protein powder that’s this cheap doesn’t taste good, and while it wasn’t the best whey I’ve ever had, it tasted good with milk and very good with water. It’s very, very rare to find a whey that works so well with water. I will say that BodyTech Whey Tech Pro is very sweet, so it was a little too much sweetness with milk. But it was just right with water. Given how cheap it is, I was ready to dismiss this product, but I was pleasantly surprised. It has good macros, it has enzymes to smooth digestion, it has a blend of isolate and concentrate, and it tastes great with water. It has the usual trappings of inexpensive protein powders: soy and artificial ingredients. 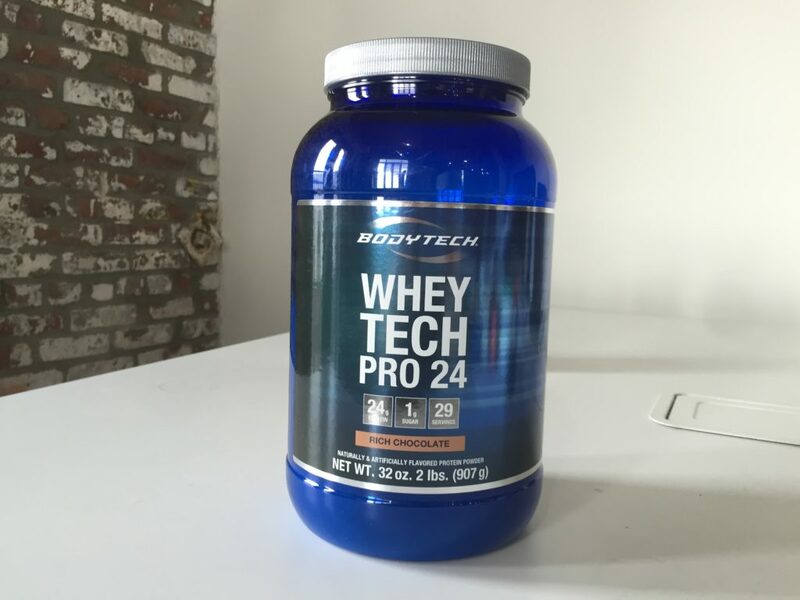 If you don’t mind them, you won’t mind BodyTech Whey Tech Pro 24.